Faculty of Economics and Management offers world-class standard education and provides its students modern facilities, rich cultural environment and a variety of study programmes to choose from. Our faculty embraces various study disciplines: management, administration and real estate management, economics, law, internal security and civil defence, as well as information and communication sciences. As a graduate of the programme you will be able to work in project teams and/or manage enterprises and affiliates. To provide Hospitality management students with opportunities to learn useful skills, which will prepare them for jobs, our faculty offers practice in the Catering service laboratory. Graduates of the programme can work as business managers, administrators or heads of departments in Lithuanian, Latvian, and foreign hospitality companies providing hospitality services, e.g., accommodation, catering, leisure, etc. 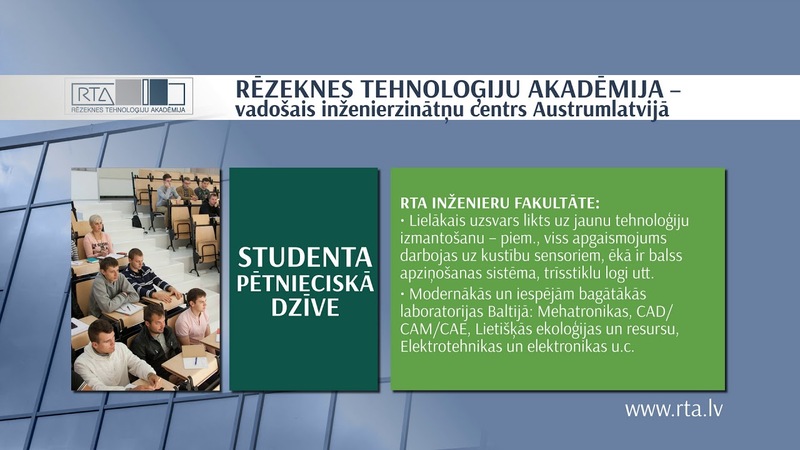 Graduates may continue their studies in social sciences area, business and management field master’s degree programmes in Rezekne Academy of Technologies and other Latvian higher education institutions, as well as in Klaipėda University (Lithuania), Vilnius University (Lithuania), International Business School at Vilnius University (Lithuania), Lithuanian Sports University, Mykolas Romeris University (Lithuania) and other universities. In future you will be able to participate in projects; manage project teams, as well as to manage micro and macro enterprises and their affiliates in tourism area. Graduates are able to manage a company and project of any scale. Furthermore, as a graduate of a master`s programme you are qualified to work as a junior academic researcher within an institute or company, or carry out doctoral research. Graduates are able to work in international companies, planning regions, municipalities, cultural and educational institutions. Furthermore, as a graduate of a master`s programme you are qualified to work as a junior academic researcher within an institute or company, or carry out doctoral research. International Student and Teacher Scientific and Practical Conference "INDIVIDUAL. SOCIETY. STATE."